From the end of the 19th century and through most of the 20th century, enamel art finally enjoys a period of re-evaluation, favoured by the avantgards and the positive cooperation between enamel and design, side-by-side with the rediscovery of traditional enamel thanks to the then-recent archaeological discoveries from the Micaenean and Mesopotamian tombs that revealed the antiquity of the technique and revived the interest of many artists. Here is a short nation-by-nation history of the enamel renaissance. After a period of decadence, starting in 1850 and for almost one century, Japanese enamel witnesses its Golden Age, in the fullness of the Meiji period. The merit of the rediscovery and success of Japanese enamel is traditionally associated with Kaji Tsunekichi, an ex-samurai who was in search of a method to keep the wolf from the door and reinvented himself as an entrepreneur of enamel art after analysing a piece of Chinese enamelware and managed to reproduce the technique using the most ancient Japanese handbooks as a guide. In 1855, Tsunekichi opens his manufacture in Nagoya, an activity that will last many decades and pass through a few generations of renowned disciples. The production of this period focuses primarily on vases, bowls and dishes with traditional shippō-enamel decorations. The Golden Age of Japanese enamel will continue up to c. 1950, spreading through several schools born of Tsunekichi’s original experience. Amongst them, it is worthy to mention the greatest: Hayashi Tanigoro, Andō Jubei, Namikawa Yasuyuki, Namikawa Sōsuke, Yukio Tamura, Kumeno Teitaro, Hayashi Kodenji, Inaba Isshin e Goto Seizaburō. Despite this, it did not completely disappear and it is still a vital part of arts and crafts in this country. It is worthy to mention a few important enamel teachers and artists: Kyoko Iio, Yoshiko Yokoyama, Hobuko Horigome, Yoko Toshimura, Otha, Akiko Miura and Suzuki. For the mural works: Toshiko and Mamoru Tanaka. The art school “Die Burg Giebichenstein” (better known as Bau Haus) will educate many artists in different fields. Among the most important enamellists, we mention here Maria Likartz and Lili Schultz, active between the two World Wars. The Pforzheim and Hanau schools will also play a role in the re-evaluation of enamel as well as all forms of arts and crafts. These movements will have their representatives not only in Germany, such as Walter Lochmüller, but also abroad, such as French enamellist J. Goulden, or in Spain, in Great Britain. A few important artists have also marked the history of German enamel, who did not belong to the 20th century movements. The most important of these enamellists is most certainly Egino Weinert (1920-2012), who will dedicate all his life to the production of religious works such as Medieval-style cloisonné icons, bronze sculptures, cathedral glass windows and even monumental works such as enamelled tabernacles and altars. A similar approach to the traditional cloisonné enamel religious art is that of Sr. Lioba Munz (1913-1997), a nun from the Fulda Abbey whose enamel works may be found in many churches in Germany. It is important to notice that they both learned the technique at the goldsmithing courses of Prof. Elizabeth Treskow. It is worthy of mention that the C.K.I. was created in Germany from the intuition of Gertrud Rittmann-Fischer, promoting enamelling and the fire arts in the world. During the Art Deco period (1920-1930), Limoges is reborn through the works of Alexandre Marty, his daughter Henriette, Léon Jouhaud (1874-1950) and Camille Fauré (1874-1956), an artist famous for his Art Deco enamelled jugs, universally recognized works of art. Thanks to the International Biennials invented by George Magadoux, from 1971 until 1994, Limoges becomes the true capital city of enamelling at an international level and inspired the birth of similar events and the creation of important museums in France, Spain and Japan. Here is a list of important French enamellists, most of them coming from the ancient Limoges tradition. Robert Barriot (1898-1979). This great enamellist, painter and sculptor, better known as the “giant of enamel” for his creation of the biggest monolithic enamelled repoussé copper panels: the seven panels forming the altarpiece of the Church of St. Odile in Paris. He is the only one in this list who is not linked to the Limoges tradition. René Restoueix M. O. F. (1924-2006). 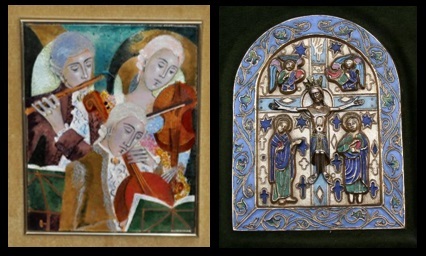 He has been an important artist and teacher of Limoges enamel art; his atelier was where the Carmona brothers learned the technique. Pierre Bonnet M. O. F. (1934-2008). Like R. Restoueix, he received the prize “Meilleur Ouvrier de France” and is thus considered one of the best representatives of Limoges enamel and a teacher of this art. Michel Betourné is one of the few French enamel masters still alive who practices the ancient Limoges technique. The Carmona brothers are among the most expert representatives of the 20th century enamel in France. Jean (1928-1995) and François (1929-1994) were born in Roussillon (Isère department). Jean works for the Givors glass industry (department of the Rhone) and attends the Limoges School of Decorative Art, where he wins a Great Prize; since 1954, he makes his first work experience by the artistic laboratory by Bonnet. His brother François studies to become a porcelain decorator in the Micheland style, and later becomes a Master of Art, working for a few years in the workshos of Poral, Prayaux and Restoueix (M.O.F.). By 1960, the two brothers work together in the laboratory of great artist Jean Betourné and open their activity in 1962. On the left: a detail from the "dance macabre" of Robert Barriot. In the centre: an Art Déco vase by Camille Fauré. On the right: a landscape of Limoges by Léon Jouhaud. In Spain, the most important name of the early 20th century is that of Miguel Soldevila I Valls and other Massana school and Llotja school artists, who followed in the footsteps of French enamellists such as Grandhomme and Garnier, turning Barcelona into one of the most important enamel centres in Europe, with great artists such as Lluis Masriera, Modest Morató Ojer, Josep Brunet, Núria Nialet, Francesca Ribas, Núria Ribot, Joan Gironés, Montserrat Mainar, Pascual Fort, Andreu Vilasís, Núria Lopez-Ribalta and world-wide famous artist Francesc Vilasís-Capalleja. On the left: violin players by Montserrat Mainar. On the right, a crucifixion by Modest Morató Ojer. Ex-Czechoslovakia becomes an important enamel art centre at least since the 1960s (source: Uměni emailu – Technika smaltu, Museo della Tecnica di Brno, 2017). All names are listed by period of activity. - Věra Janoušková (1922-2010). Though not an enamellist, this artist produced many sculptures using enamelled housewares, flame-cut and soldered to each other. - Jan Nušl (1900-1986). Student at the Academy of Arts, Architecture and Design (VŠUP) in Prague. He gave his life to this technique, teaching in the same Academy and educating two generations of enamel artists. - Jana Cepková (nata nel 1939). A disciple of Jan Nušl and wife of Slovak artist Anton Cepka, one of the founders of Constructivism in Czechoslovakia. She won a prize at the International Biennial in Limoges in 1978, and she took part in different exhibitions in Vienna, Hanau and Pfarnheim. - Eva Žaková-Št’astna (1944). Another student of Jan Nušl, she was able to renew the traditional enamel with new technologies and techniques. In 1985, she organized the Modern Czechoslovak Enameller’s Exhibition in the Atrium in Prague, where he took part in it as exhibitor. - Eva Kučerová-Landsbergrová (1947-). An artist from Místek, in the Beskid mountain chain. She graduated at the Applied Arts Secondary School in the Moravian city Uherské Hradiště, specializing in graphic drawing in 1967. Her works are influenced by the mountain and forest landscapes of her land. - Radka Urbanová (1947-). She studied at the Applied Arts School in Prague. She began to practice enamelling in 1995. His jewels and enamelled objects often combine stylized creatures and humour with the presence of mobile components, as for toys. In 1998, she won the first prize at the International Fair of Jewellery in Keckemét and the 10th Prize for Cloisonné Jewellery in Tokyo. Today, she is the director of the Mňau Gallery. - Alena Novaková (1929-1997). Belonging to the second generation of Jan Nušl’s students at the Academy of Arts, Architecture and Design in Prague. - Olga Francová, Alexandra Horová e Madla Cubrová. Students at the VŠUP. They formed a short-lived women-only enamel group. The artists later parted ways and continued their careers. - Veronika Richterová (1964-). After studying at the Fine Arts Academy in Prague, she specialized in enamelling at Paris in the Decorative Arts School but did never disdain the other materials and techniques. Her use of enamel is original for the creation of enamel sculptures made of non-conventional supports (such as pipes) coated with shiny-coloured industrial enamels, often with a humour intent. Italian enamel art re-flourishes since the beginning of the 20th century after a long period of decadence. Its first epicentre was the city of Milan, while the rest of Italy developed its own schools, ateliers and enamelling centres mainly after the end of the Second World War. Since the first years of the 20th century, a sort of “Milan School” was born that left a mark that would last for a large part of the last century. Guidi Giuseppe (1881-1931) is the first enamel artist of the 20th century. He worked not only with enamel, but also with etching, book illustrations, and drawings. Born in Castel Bolognese, he had a life worthy of a novel. He graduated with a diploma from the art school of Faenza, but after many vicissitudes he got to Milan to attend the Brera Academy. Very soon, they called him to work with etching. He opens his first atelier, but it is only after the 1920s that he started to work with enamel. He developed two techniques, in particular painted enamel, and learned how to melt his own enamels. He practiced the Soft Cut Champlevé technique. Luckily, D’Annunzio noticed him and considered him his favourite artist, granting him his fame. He died suddenly at 50, leaving incomplete works that witness his innovative technique that would influence Martinotti, Maretto and Paganini after him. Luigi Martinotti (1890-1962) from Turin. He received his education in Milan at the Castello Sforzesco School. Nine years younger than Guidi, Martinotti used the same technique for the sacred works. Martinotti belonged to the great figurative tradition of the previous eras, and in a letter, dated 1957, he expressed his hope that the other contemporary artists refer to it, abandoning “every form of abstract art, intellectualism and elucubration”, a danger when it comes to the transmission of God’s Word through art. Giuseppe Maretto (1908-1984), a sculptor, he created bronze works between the two World Wars and, after the Second World War, he was active in Milan with exhibitions of profane and sacred art. His production was fruitful, so it is not difficult to bump into one of his works. Soft cut was his main technique, but he also used plein émail, after a technique that he claimed from the Japanese enamel art, called Musen-Shippō. He probably attended Guidi’s atelier or knew his art, as shown by the similar techniques. Ettore Paganini (1922-1986), from Milan, he graduated at the Brera Academy, where he met Carlo Carrà, who had attended Guidi. His “soft cut” technique would influence Paganini. Famous for his sacred art, for which he adopted occasionally the same technique as Martinotti, who most probably was his master, but using chisel and burin to engrave the metal rather than acids, which results in thinner drawing lines. His activity developed prevailingly in Lombardy, where he received prestigious commissions in the religious environment. With great skills in metalworking, Enzo Ciorba (1917-1972) from Viterbo graduated from the Superior Institute for Artistic Industries in Villa Reale, Monza in 1931, then he was called to teach at the art school in Castelmassa di Rovigo. Rino Brunelli, a talented disciple, would be worthy to replace him in his teaching position. Another good expert in repoussé, Carlo Pellicciari, would unfortunately die at a very young age. Turin was an important enamel centre right after the end of World War II. During this years, at the Libera Accademia, drawing professor Idro Colombi and a few of his disciples discovered enamel art through the works of the Ligugé monastery during an exhibition in Turin and decided to learn the technique. They soon founded the Comunità Artistica, where enamel was the main form of art. In 1957, two married couples among his students (Virgilio Bari and Lidya Lanfranconi, Bianca Tuninetto and Euclide Chiambretti) founded their own atelier, called Studio Del Campo, that will be active in enamel art and design until 1997, with a large production that became famous even abroad. Two of them (Euclide and his wife Bianca) continued the work until 2005 under the signature Euby. Everything begins right after the War, in 1945, at the art school (now “Liceo”) Mengaroni. Great teachers and artists, such as Vangi and Vannini or the director Ferri (also an artist) turned it into a forge of many new artists. We mention here the enamellists starting with FRANCO BUCCI, a man of great qualities who, after the diploma, became a little entrepreneur, founding “Mastro 3” and the laboratory of Pesaro. He was skilled that he was also called to teach in the school he had learnt his art. Later, FRANCO BASTIANELLI also became an entrepreneur and founded “Studio Laurana”. UBALDO CINCIARINI founded the “Studio Cellini”. MARCELLO BALDASSARRI, ROMOLO VERZOLINI and ALDO JACOMUCCI were also valid artists and/or teachers. ORLANDO SPARAVENTI, the youngest of this generation, has been a teacher and an artist appreciated at an international level. Paolo De Poli (1905-1996) did not attend Giuseppe Guidi but took part in a posthumous exhibition and got in touch with his style. Despite this, the works of De Poli will follow an autonomous style. He is famous for his cooperation with Gio Ponti that will give him impulse and push him into the world. Some of his disciples/workers will continue with excellent results also in teaching: Luigi Barato and Gabriella Gabrini. BOTTEGA DELLO SMALTO (lit. “enamel workshop”). It was the idea of Sister Teresa Valsecchi to open this “workshop” with her fellow student Luisa Marzatico. During her life she taught the art of enamel to at least a hundred young students and, once at retirement age, she opened this school, always inside the “Liceo Artistico del Preziosissimo Sangue” in Monza. Both a religious and an artist with great charisma, she transmitted her passion for the fire arts to her disciples. She loved the cloisonné technique of Egino Weinert, a German goldsmith from Cologne, whom she managed to meet personally. At present, Bottega dello Smalto continues its activities and educates several artists, many of which are also members of C.K.I. Italy. (In alphabetical order. All present-day CKI artists are excluded from the list but may still be listed as disciples of other great Masters). Giuseppe Calonaci (1931), born in Poggibonsi (Siena). He is the founder of SIVA, a successful factory of enamel art of steel. Giuseppe Capogrossi (1900-1972), a famous Roman painter. Unknown to the most, he produced at least one enamelled vase with its typical fork-shaped signature marks. Cosimo Corvaglia (1948-2004), teacher at the Art Institute of Poggiardo (LE). He produced the Way of the Cross in the Otranto Cathedral in modern-style cloisonné. Lanfranco Fenaroli (1942-2009), sculptor, painter and enameller from Bergamo. Giulio Gottardi (dates unknown), who studied at the Art Institute of Trento and authored of an enamelled copper plate in San Francisco in 1970. Leonardo Gristina (1914-1998), a Dominican monk from Catania. His enamel art production is not restricted to sacred art. He exhibited his works in Milan in 1967 and was interviewed by RAI Regione Sicilia in 1980. Roberto Guidi (dates unknown) from Pisa, ex-teacher of chisel and repoussé at the Volterra Art Institute until 1997. May Hofer (1896-2000), born in Chybi (Krakow, Poland), she moved in Pola and later Vienna. In 1919, she married the artist Anton Hofer and moves to Bolzano. Back to Vienna after World War 2, she learns the art of Russian enamel from Marika Nedbal-Donizka. She died in Bolzano at 104 years. A disciple of May Hofer is Loris Cavallari (born 1961). Giuliana Maraschin (GM Lerino – Vicenza), she possibly worked for De Poli. She enamelled panels that were worked by repoussé by Ottorino Barato & Figli. Eugenio Pieraccini (1922-1980) from Viareggio, painter and enameller. Recognizable for his subjects such as monks, priests, spouses and naked women. Ernesto Treccani (1920-2009). He is the son of Giovanni Treccani (founder of the eponymous encyclopaedia). In the 1960s-1970s, he produced an enamel cycle inspired to the novel “The Moon and the Bonfires” by Piedmont writer Cesare Pavese (1908-1950). Aldo Raimondi (1902-1997), famous for his watercolour paintings. He probably got in touch with enamel through his colleague Carlo Carrà at the Brera Academy. At least one enamel painting of his has survived to the present day. On the left: a vase by Franco Bucci. In the centre: a peacock by Paolo de Poli (design by Gio Ponti). On the right: a painting by Nino Brunelli. For about 35 centuries, the enamel art techniques have evolved and perfected, handed down through several populations that were culturally, religiously and socially different from each other. They have been absorbed and transmitted by several schools and artistic movements. Most importantly, the fascination of this technique has managed to outlive the passage of time and to overcome any obstacle, surviving unchanged to this day. It remains a difficult art just for a few artists who fall in love with its amazing results, visible only after dozens of firings at 800°C. It is for an unfathomable destiny that these techniques are still practiced today almost in the same way.